There’s no shortage of small PCs in the market, but it could be argued that there is a shortage of small PCs that look awesome. If that’s the measurement, ASUS has hit the ball out of the park with its ROG G20. Not only does this PC have what it takes to stand out of the crowd, it boasts impressive specs and features to go along with it. Over the years, we’ve seen our technology get faster while at the same time assume a smaller physical form. That’s led to an explosion of small PCs, with companies trying to outdo one another by shrinking down as much as possible without compromising performance. It goes without saying that if all you’re looking for is a small PC, the options are endless. But if you want a small PC that truly stands out of the crowd, then you’re going to have to look a bit harder. I can say with certainty that ASUS’ Republic of Gamers G20 is one option that makes you do just that. When ASUS announced its G20 (and the even smaller GR8), I had no idea that its styling was going to become a theme across most of the company’s upcoming ROG products. 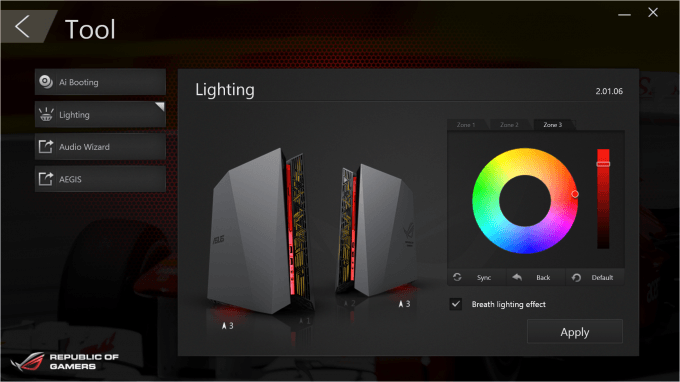 ASUS calls it a Mayan design, and we’ve seen it carried through to the ROG peripherals that were announced at CES. This PC’s a looker, that’s for sure. Being an ROG product, there’s no secret about who the G20 is targeted at, but it’s too simple to say “gamers”. This particular model has a mid-range GeForce GTX 760, so it’s not quite targeting “high-end” gamers, and if high-end gamers do in fact buy it, they’re likely to use it as a second PC. 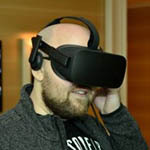 Who this is best-suited for is someone who doesn’t care about running ultra-high detail levels in their games, but do appreciate great aesthetics and small form-factor. 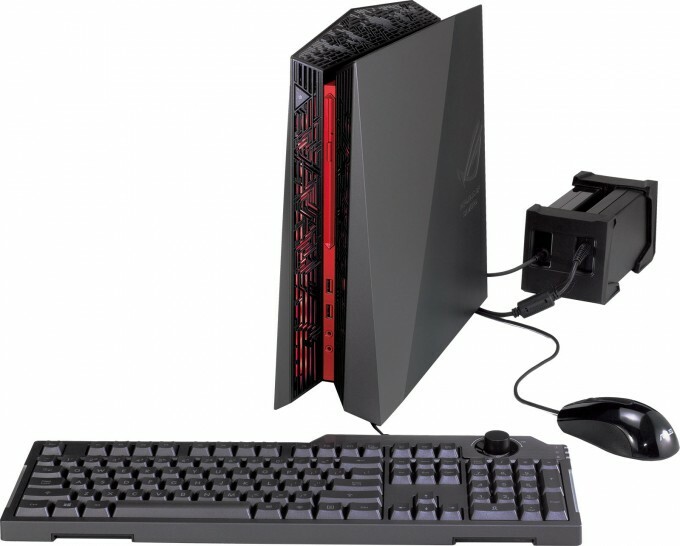 Like all of ASUS’ PCs, the ROG G20 is available in a number of different specs. The PC as tested (G20AJ) retails for about $1,200, and includes Intel’s top-end mainstream processor, the Core i7-4790, and NVIDIA’s mid-range GeForce GTX 760. A model exists that includes the fast GeForce GTX 780, although it’s strictly available only for Europe. At this time, the GPU included in this particular version of the G20 is last-gen, but as ASUS’ product page for this PC lists both the GTX 970 and GTX 980 as options, I’d assume that those models are en route. I hope that unlike the GTX 780 version, those will be available in North America as well as in Europe. Companies often have to make some noticeable compromises in order to build powerful-but-small PCs, and some of those are noticeable with this one after looking over the table above. First, there’s no SSD, which, to me, is a concern. Once you use a PC equipped with an SSD, you really know it when you’re using one that isn’t. I used the ROG G20 over the course of five days as my primary PC, and I can tell you that the lack of an SSD was noticeable. That’s despite a “hybrid” model being used, which includes 8GB of NAND for caching. I’d imagine that the next ROG G20 revision will include an M.2 slot, as those are becoming more common – and as I’ve discovered over the past week with another system that hit our lab, they can be fast. Nonetheless, it’s impossible to ignore that there’s no SSD on this model, and it’s unfortunate. The second thing that stands out is that the memory operates in a single channel mode, due to the use of a single 8GB DIMM. I’m confident that in the grand scheme, this will affect little in the real-world, but it’s worth noting nonetheless as this is typically more common with notebooks. The G20 does have a second DIMM slot, but as cracking the PC open voids the warranty, it’s up to you to decide whether or not a RAM upgrade is worth it. Since the ROG G20 doesn’t have room for an internal power supply, an external one is provided – and it’s definitely one of the more unique ones I’ve seen (you can see it in the shot at the top of the page). It’s in effect two PSUs in one; one half is spec’d at 230W, and is for the PC itself, while the other half, spec’d at 180W, is used to power the graphics card. If it’s not clear enough, yes, this means you’ll be plugging in two power cables for this one PC. As all of these photos will highlight, the ROG G20 has a unique, attractive aesthetic. With its Mayan design, ASUS was able to provide air vents that don’t just do their job well, but look great at the same time. Truly, I feel that this is one of the best-looking PCs I’ve ever seen. At the front, and top, is the G20’s optical drive. At the bottom, as seen in the shot above, are dual USB 3.0 ports and audio in / out ports. None of the shots I took showed off the power button well, but it’s situated at the top-left, and can be easily seen in this stock photo. The ROG G20 includes a total of 8x USB ports, with 2x 3.0s at the front as just mentioned, and the others (2x 3.0 and 4x 2.0) at the back. Also located there are a near-full complement of audio ports (S/PDIF is absent), Ethernet, dual HDMI (one on the graphics card; the other feeding into the integrated graphics), dual DVIs, and also DisplayPort. You can also see the two required power connectors. As I mentioned earlier, ASUS has creatively worked with the Mayan aesthetic here to provide a lot of hidden ventilation. This is the kind of design I love to see: not just good-looking, but functional. Here’s another, perhaps better view, which shows us a vent strip that lines the top of the PC. There’s not much more I can say about the ROG G20 that I haven’t already said. The PC both looks great and has a good design. One thing pictures can’t tell you about the PC is that it’s very sturdy. Merely holding it, I got the distinct impression that the PC was well-built. While it is possible to crack the G20 open, I couldn’t figure out how without worrying about breaking something. If you want to get a quick glimpse of what it looks like inside, check out this picture. As is common of most pre-built PCs, the ROG G20 comes packed with a bunch of extra software that you may or may not want. Fortunately, the bulk is tied to ASUS’ own offerings, with exceptions being Microsoft Office, Adobe Reader, CyberLink PhotoDirector 3, CyberLink PowerDirector 10 and Lucidlogix’s VirtuWatt. 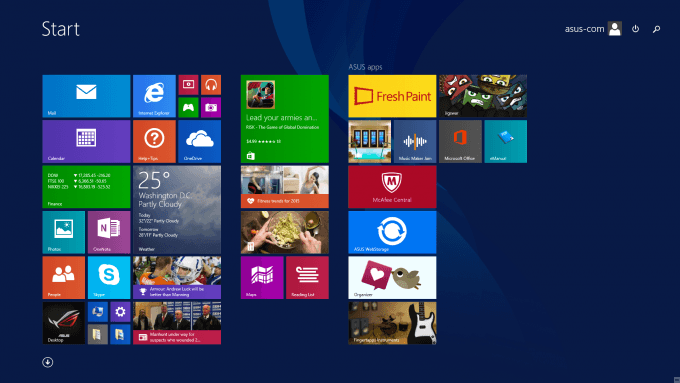 You can see a full list of what’s pre-installed here. Interestingly, the included wallpaper is only available in 1080p, a clue as to what resolution you’ll be gaming at (which would be accurate). The reason I mention the wallpaper’s resolution is because I had the G20 originally connected to a 1440p monitor, and so the desktop looked a little odd. I’ll forever wonder why companies do this, but ASUS has split the 1TB drive into two partitions; the OS one is 149GB, while the other is 762GB. 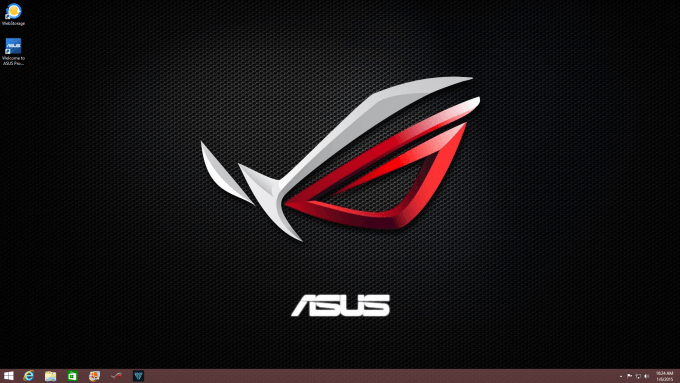 There are three main ASUS apps on the ROG G20 that I’d recommend checking out: GameFirst II, Aegis, and Command. GameFirst II might be the first of these three you’ll spot because it launches a widget on your desktop by default. 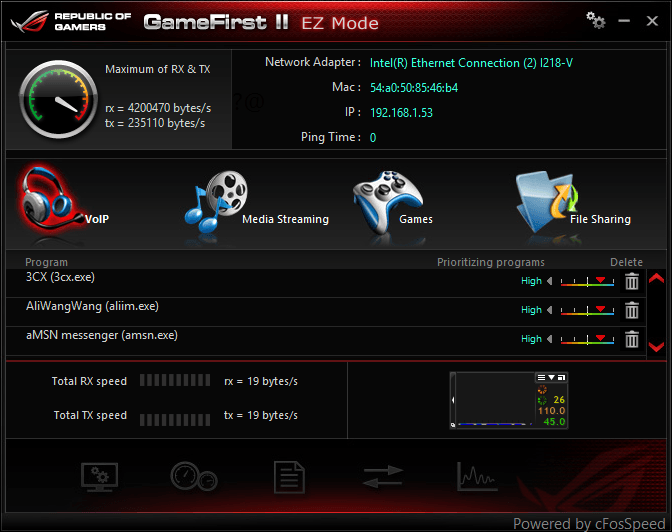 Overall, GameFirst II’s goal is to help you make sure that your online gaming performance is always at its best. Beyond that, you can also take advantage of in-depth monitoring, create online budgets, and customize the widget. It’s easy to grasp the full potential of GameFirst II, but I think its usefulness will hugely vary based on your needs. I personally haven’t ever felt the need to optimize my traffic for online gaming, simply because I’ve never encountered standout issues. Your situation could be different, however, especially if you play many twitch games. If you play competitively, your need for a networking solution which caters to gaming could be hugely important. For those who don’t care about optimizing their networks, the widget can still be taken advantage of. However, a huge beef I have with this is that it’s not scalable, and even at 1080p, it’s small. If this widget was scalable and also had the ability to be an overlay in your game, I think it’d be a hugely popular feature. Whereas GameFirst II monitors network traffic, ASUS’ Aegis monitors that and more. 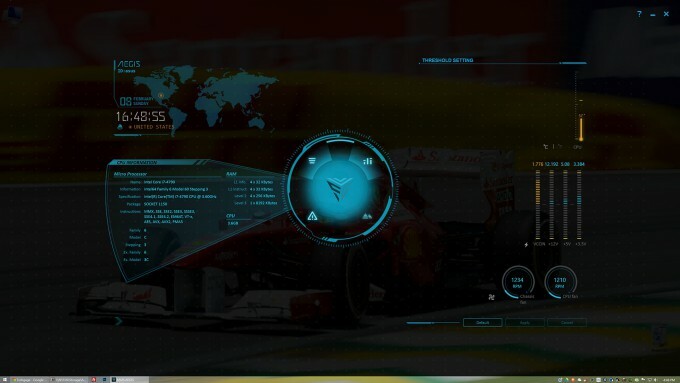 This is an interesting full-screen app that makes your PC look like a command center from some sci-fi movie. There’s really not much to adjust here; it’s more for sitting back and soaking it in. It does look good, though. I admit that I don’t quite get the point of Aegis. It’s neat to look at, but I think you’d have to be awfully bored to load it up just to watch it. If this were a screensaver, my tune would change completely – that’d be extremely cool. At least Aegis scales to higher resolutions, unlike GameFirst II. 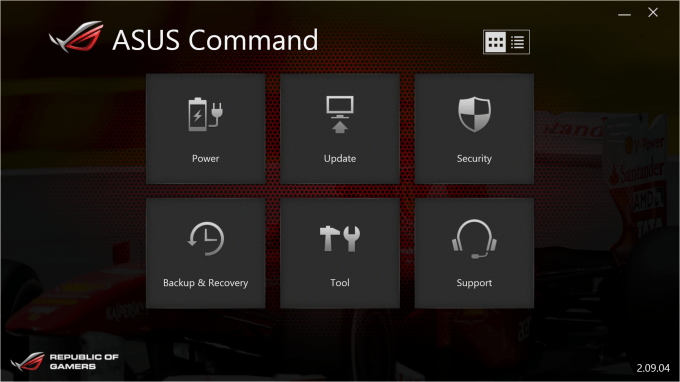 The final piece of software worth checking out is also the most important: ASUS Command. In the Power menu, you’ll be able to adjust basic options for the available power profiles, as well as enable or disable Ai Charger II, which will allow you to use the bottom USB 3.0 port in the front to charge mobile devices faster. To update either the system drivers or ASUS software, you can venture into the Update menu. From a fresh system, I only had to update two separate things, so don’t expect to see a ton of action here. You might think that something anti-virus or firewall related would be found under the Security menu, but not so. Security in this context revolves around your browser history, which this tool will purge. For some reason, using this feature crashed the app on me. The Security section will also point you to a feature that would have likely been overlooked: ASUS Secure Delete. When you right-click your Recycle Bin to empty it, you can choose to use Secure Delete to make it so that the files are unrecoverable – just the right thing in case you accidentally saved a screenshot of your 0:20 kill/death ratio. The Backup & Recovery section largely acts as a front-end to basic Windows functions, such as refreshing the PC or creating a backup through System Restore. The final menu (outside of Support, which is self-explanatory) is Tools. Here, you can reboot straight to the boot menu, adjust the G20’s lighting, and get quick access to ROG AudioWizard and Aegis. There are a total of three areas on the G20 that show lighting; left and right at the front, and underneath. Should you not want the LEDs, you can simply move the slider to black, sync, and apply it. If you’ve used any peripheral that offers adjustable lighting like this, you’ll know what to expect – color representations won’t be perfect, but they’ll be close. With that look at the hardware and software out-of-the-way, let’s move into gaming performance.